All necessary parts for installation in one kit. In order to protect your data security, Alpine provides you the 2 clicks data security function. By default, social “like it” buttons on the Alpine website are not activated. They can be activated with a first click on the button. With the second click you can then send your referral for the specific page which you wish to recommend. Please also read our data protection. This installation Kit can be used for Audi A3 models produced from July 2008 to January 2010 (8P / 8PA). The parts for mechanical fitting are included as well as a steering wheel remote control interface that also supplies CAN to analogue conversion for ACC, Vehicle Speed Pulse and parking brake. Includes an interface which will support the car’s radio display in the instrument cluster (MFD). 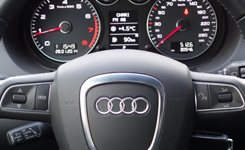 The steering wheel remote interface includes adapters to maintain the original amplifier of the Audi sound system if desired. Antenna adapter with phantom feed is included. The unit is compatible with steering wheel remote control systems so it can replace the factory-installed head unit without loss of this convenient option. Additional parts required ! Shows advanced information on your vehicle’s external display. Supports basic functions of original steering wheel remote control including telephone hook on/off. When using KIT-8A3DF it maintains also functionality of the vehicles multi-function display. This installation kit is designed only for vehicles with square hazard light switch under the radio. Please confirm that the switch can be removed individually. For cars with RNS-E Navigation as original system, no additional parts are needed. For A3 (8P/PA) models which have been equipped with one of the 1 DIN models listed below, Audi dealers can provide parts for changing the 1 DIN installation slot to a 2 DIN space. Note: Consult your Audi Specialist for details.